Earlier PLCs use as only controlling device. you make the program, download the program in PLC and it will run for years. 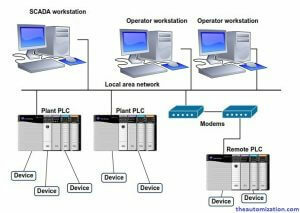 Nowadays the automation system is a combination of PLCs and SCADA software. If you use PLC & SCADA combination the advantages are that you have better monitoring and control of the plant and also you have access to the information the way you want. SCADA installed on PC.and run on PC. SCADA is communicating or connected with plc or other peripheral devices. It enables you to generate applications for the most demanding requirements of different operator tailored precisely to the needs of each plant. SCADA constantly fetch data from the plant in real-time, data stores on a database, processes it in the database generates report, evaluates and generates alarms, show information on display plant operators to plant operators, supervisors, and managers. 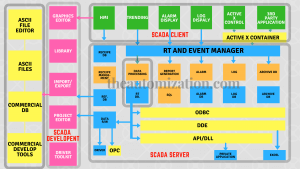 SCADA systems are majorly used in industry for Supervisory Control and Data Acquisition of industrial processes. As the name indicates, that is not a full control system, but that focuses on the supervisory level. As such, that is a unique software package that is connected with Programmable Logic Controllers (PLCs) or other commercial hardware modules. One difference two basic layers in a SCADA system: the “client layer” which refers to the man-machine interaction and the “data server layer” which handles most of the process data control activities. The data servers communicate with devices in the field using PLC. Process controllers, e.g. 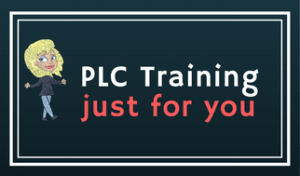 PLCs, are connected to the data servers either directly or via networks or field buses that are or non-proprietary (e.g. Profibus). Data servers are connected to each other and to client stations via an Ethernet LAN or some other Communication media. The software multi-tasking and are based upon a real-time database (RTDB) located in one or more servers. Servers are responsible for data acquisition and handling (e.g. polling controllers, alarm checking, calculations, logging and archiving) on a set of parameters, typically those they are connected to. Details on the construction of the works.